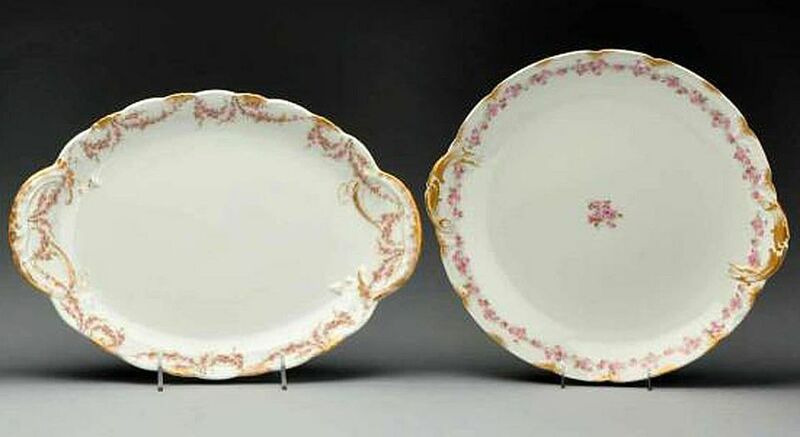 David Haviland, a china importer who partnered with his brother Daniel, moved to Limoges, France in 1842 so he could begin producing decorated china made expressly for the American market. In the beginning, he purchased whiteware from many Limoges factories and had the pieces decorated in Paris. In 1865, however, Haviland procured his own factory and began producing porcelain blanks as well as hiring a local decorating staff to complete the process under one roof. The name Haviland, according to Warman’s Antiques & Collectibles edited by Noah Fleisher, is “synonymous with fine, white, translucent porcelain, although early hand-painted patterns were generally larger and darker colored on heavier whiteware blanks than were later ones.” The patterns were so well-respected in the United States back when they were new that brides with discriminating taste often selected Haviland dinnerware sets as their wedding china, especially during the late Victorian period, as noted by Limoges historian Mary Frank Gaston in her writing. Charles Edward Haviland and Theodore Haviland, David’s sons, began working for the family porcelain business in 1864, and by 1878 the company was the largest in the area, according to Warman's English & Continental Pottery & Porcelain: Identification & Price Guide by Susan D. Bagdade and Al Bagdade. The brothers took over the company when their father died in 1879, and split the company in 1892 after a difference of opinion. Theodore went on to open an American division in 1936, and in 1941 bought out his brother's heirs to form one company yet again using the original name: H & Company. The firm remained family owned through 1981. These older wares should not be confused with Johann Haviland dinnerware made in Germany. Those patterns, which are thicker and have decaled floral designs, were made for distribution in grocery store chains much later on. Until David Haviland purchased his own factory, whiteware blanks were produced in one location and then decorated in another. The practice continued well after the mid-1800s, of course, but Haviland revolutionized the industry in Limoges, France by making and decorating china in one location beginning in 1865. Pickard operated in much the same way, decorating whiteware, in the United States in the late 1800s. Haviland was the first company to use decals to decorate china. Before the introduction of this practice, all décor was hand painted only. After the introduction of decals, they were used alone and in combination with hand painted embellishments. Many collectors prefer the older hand painted pieces and will pay a premium for them. It is estimated that 20,000 different Haviland patterns were produced, and their similarities can make them quite difficult to identify, according to Bagdade’s reference guide. Patterns included not only place settings, but a full array of serving pieces like platters, soup tureens, pitchers in various shapes, and gravy boats along with tea sets. Most Haviland patterns made before 1926 were not named. The numbers assigned to various patterns by Arlene Schleiger in her books are commonly used in identification these days. These are often referenced as “Schleiger numbers” by collectors and used in buying and selling Haviland pieces. These guides are out of print, but worth locating through used booksellers for those serious about collecting Haviland. A china matching service can often help collectors figure out the names of their patterns and complete sets once they are identified. While Haviland is primarily known for china patterns, they also produced various decorative wares that are sought by collectors. These range from beautifully decorated cabinet plates and dresser trays to varied figurines. The original name of the company was H. & Company, as noted above. Many early pieces were marked H & Co. with an L under a line denoting Limoges, France. Other pieces were marked H & Co. L France. When the white “blanks” were produced in one factory and decorated in another, more than one mark may be present on a single piece. Porcelain factory marks will be under the glaze while decorating marks are stamped over the glaze. Special orders from railroads, department stores, and restaurants may also have an additional mark indicating this was the case. Some sets will be marked with a pattern name as well.